I call this fruit and nut bar recipe “Everything But the Kitchen Sink Bars” because I use literally anything I can find in them. My kitchen cabinets are filled with little bags of nuts, dried fruit, and cereal from all the recipes that I attempt. So, I grabbed some unsalted peanuts, pecans, almonds, Cheerios, and sunflower seeds and mixed them with raisins and dried cranberries. Last time I made them, I used hazelnuts, almonds, cashews, dried apricots, and raisins and they were delicious. The idea here is to either use everything in the house up OR make your favorite flavor combination. Like dark chocolate and dried cherries? Go for it. Want to add turmeric, chili powder, or curry powder? Why not? Add unsweetened coconut, Goji berries, or dried blueberries – whatever floats your boat. Sometimes, I don’t even make the bars. I simply make this bowl of chopped nuts, cereal, and dried fruit, and put it in a container for later consumption. I mix it into yogurt, toss it into my kid’s lunch boxes, or grab some for a quick snack. These never hang around the house for very long. I love the way the toasted nuts are fragrant and fresh. 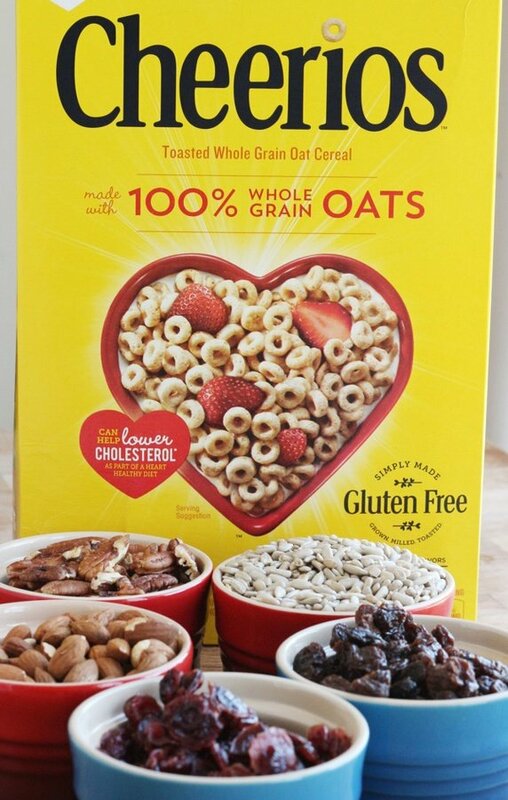 If you want to make a lower calorie bar, add more Cheerios (or other unsweetened cereal). The cereal is much lighter than the nuts and adds a nice texture. What I like about these bars is that I can make them smaller than a packaged fruit and nut bar and put them in a little baggie to toss in my purse. I like my snack to be around 100 calories so this is a good fit. I did use light corn syrup for this recipe which will drive the non-GMOers crazy. I couldn’t find brown rice syrup which would work equally as well in my Stop & Shop. You cannot use maple syrup because it isn’t thick enough. 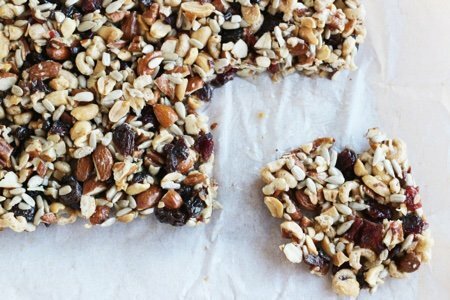 Have you tried to make your won fruit and nut bar? What did you use? Preheat oven to 325 F. Line an 8-inch square baking pan or 7”x 11” glass casserole dish with parchment paper AND spray it with non-stick spray for easy removal of the bars. 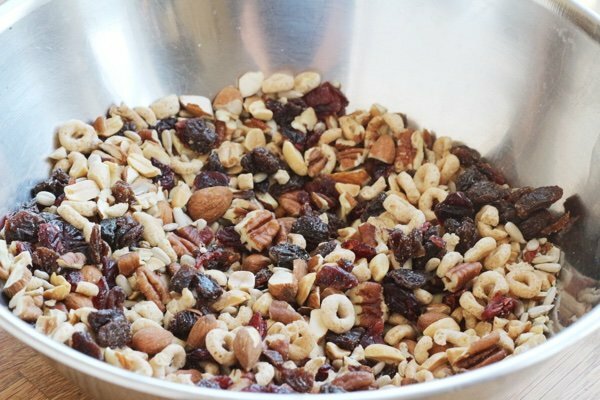 Mix together nuts, dried fruit, and cereal in a large bowl. Pour over corn syrup and add a dash of salt. Mix well and spoon into baking pan. Press the mixture down with the back of the spoon. Bake for 17-20 minutes until lightly browned on the edge of the bars (see photo). Cool on baking rack for 20 minutes and slice into 16 bars. Store at room temperature for three days, refrigerator for 2 weeks, or freeze for later consumption. Nuts and seeds: walnuts, cashews, hazelnuts, brazil nuts, almonds, peanuts, pecans, pine nuts, sunflower seeds, pumpkin seeds, sesame seeds, etc. Cereal: Puffed wheat, Cheerios (chopped), Brown Rice cereal, Rice Chex etc. Dried fruit: raisins, apricots, dates, cherries, cranberries, figs, mangoes, shredded coconut, apples, prunes, peaches, etc. This is one of my favorite recipes from the Blog. I make it with brown rice syrup and it works perfectly. This is a recipe I often make to carry with me when I travel. I use lots of sesame seeds because I love them. So satisfying!! Thank you, Snack Girl!!! Sounds really good, but people don't use corn syrup! Will be making this. These look great! I wonder if honey would be thick enough? I will have to try - thank you for the idea! I have a similar recipe and the only sweetener in it is one can of condensed milk. I am addicted to the bars, make them every week. You do bake them, also. Very similar looking to Kitchen Sink recipe which I'm going to try next!! Karen, is your recipe "raw" or cooked similar to Snack Girl's recipe? It is fairly identical. Parchment paper in 9 x 13 pan, mix all the stuff well (I use a thin spatula to get every bit of the c. milk out), press down into pan. Bake at 350 for about 20-25 minutes, edges will be a bit golden. The bars are chewy. I store them with saran wrap around them in a cookie tin . One difference between light corn syrup is that it is about 320 calories per 1/3 cup and a can of sweetened condensed milk is 1717 calories. I haven't made the bars either way and am making no opinion about the worth of either ingredient. Good point. I get about 22-24 bars out of the 9 x 13 pan. So mine have about 3x the calories of the other recipe. I would love a way of making this involving some sweetener other than the sugar whether it be corn syrup or condensed milk. If I use dates for some of the ingredients it would be sweeter but what would I use as the liquid then? Karen, you could soak the finely chopped dates in a small amount of hot water for a few minutes. It gets very gooey. Then just add your other ingredients. Vicki, this is a VERY good suggestion! I will try it. I am addicted to these things now! I have one every night around 8 pm as my "dessert". You could also add a bit of cinnamon, and/or some shredded coconut. I have a candy recipe that uses the soaked dates with cinnamon. It's yummy. I sometimes make my own peanut butter. Just peanuts! And sometimes salt. No sweetener. It's not necessary. When you shop for peanut butter, read the I ingredients and choose one with just peanuts and salt...no extra oil or sweetener! B grade is suppose to have more minerals. FOUND THE ANSWER!!! After experimenting for about 6 months with various things from honey to agave syrup to coconut oil, and about 4 other items alone or in combination I finally discovered COCONUT NECTAR! Not syrup. NECTAR. It is the stickiest substance I have ever used in the kitchen. 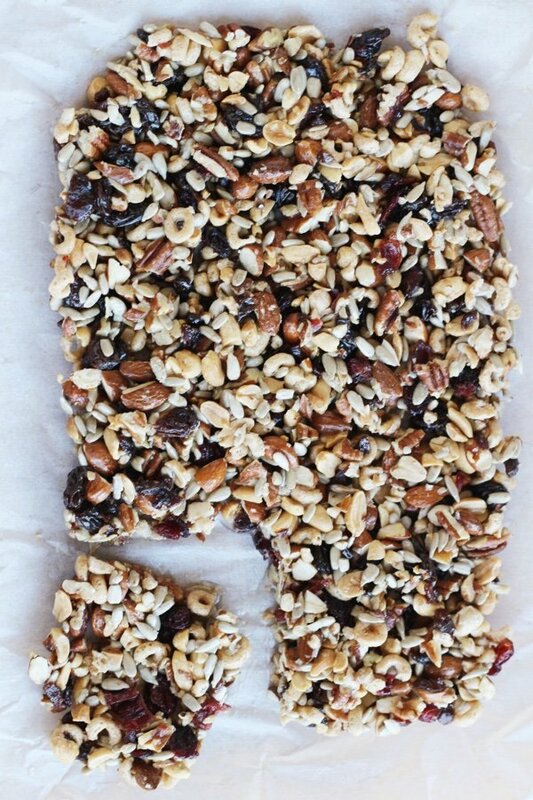 Just 2/3 cup of it was easily able to hold together an entire 9 x 13 pan of fruit/nut/seed bars! LOVE the nectar! It is enough to sweeten it all as well, in fact I think I could even cut it down to less than 2/3 cup but coating all of the ingredients might be a chore. I also substitute coconut flakes (unsweetened) for 2 of the 3 cups of rolled oats in the recipe. I am addicted to the bars.